The same tragic scene is playing out across the North as seasonal riders, with a tear in their eye, stable their steeds for a long winter’s sleep. C’est la vie, time for the trainer, you may be thinking. Please, don’t let this misfortune befall you. The winter season can give the dedicated rider some of the most fun and memorable rides of the entire year. It can be a time of solace and reflection, as well as a time to put in serious relationship maintenance with your riding partners. Winter weather is an opportunity to add some variety to your cycling surfaces. Photo by Steve Taylor. Regardless of your approach, you must not take the proverbial knife to a gunfight. To enjoy winter riding means to be prepared. First, take a look to your bicycle to make sure it is ready to take on the demands of the season. To ensure your bike is properly equipped to provide you with trouble-free use, it pays to have any and all preventive maintenance done before the weather really turns south. A trip to your local friendly bike mechanic is a great starting place. Having your bike gone through gives you more than just peace of mind. It could also keep you from getting stranded due to a mechanical failure. That mile walk home or that thirty minute wait for a buddy to pick you up after your bike fails gets a whole lot crappier when the temperatures plummet. If the mechanic suggests replacing a worn chain or a wobbly wheel, do it. Having your ride checked by your local bike shop gives you more than just peace of mind. It could also keep you from getting stranded due to a mechanical failure. Besides preventive maintenance, there are a few modifications you can make to your bike that will result in a higher smile-per-mile ratio. I will cover specific accessories that will allow you and your bike to better take on the winter season. Lights: If you do not normally ride with illumination, the winter is a good time to invest in a nice set of lights. Even if you never plan on riding at night, consider that besides the hours of daylight being shorter, the intensity of the sun is also greatly reduced. On a cloudy, rainy, snowy winter day, it is much darker than it would be on a cloudy, rainy summer day, and visibility is compromised. 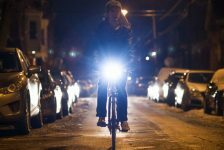 If you do plan on riding through the dark, make sure your lighting system is up to snuff. Your light should provide enough power to safely spot and avoid road hazards, as well as have a battery that provides enough burn time for you to do your ride and then some; you never know what little surprises you may encounter. Lights are not the bulky inconveniences of yore. These lights are small, powerful, rechargeable, and just plain cool. Photo by Evan Perrone. 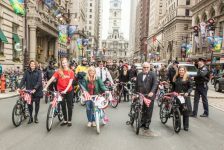 Tires: For many riders in Philadelphia, puncture resistant tires are de rigueur given the amount of debris found in the streets. If you are not rocking some puncture resistant tires, now is the time to upgrade. I can attest to how awful changing a flat tire can be in the winter. Numb, greasy fingers, a seemingly unshakeable chill, and many obscenities are to be expected if you encounter a flat. Reduce the likelihood of this occurrence with tires that have puncture resistance. If you plan on riding in snowy conditions, a tire with some tread is also something to consider. Make sure your bike can accommodate a larger tire before you pony up your pesos. Diehard commuters often put on studded tires to really make their machine invincible to icy freeze-thaw conditions. Keep in mind that knobby and studded tires will accelerate, brake, and corner differently than your summer treads, so take it easy your first few times out to get used to these changes. When in doubt, ask your local bike shop for advice. Puncture resistant tires will take the confidence  and the miles  to a new level. Photo by Evan Perrone. Fenders: Winter is often a time of year for frequent dampness and unpredictable precipitation. Fenders are your friend. They give you and your vital bike parts a barrier between water, salt, slush, and cinders which will accelerate drive-train wear and ruin your expensive duds. The cleaner you can keep your drive-train, the longer it will last. Most fender prices top out at 50-60 dollars a pair: much less than a new drive-train. Don’t panic if your bike lacks traditional fender mounts; many aftermarket companies provide fender solutions for bikes not intended to take a full coverage fender. Fenders aren’t just functional. A bike can be given panache with fenders that provide a strong statement or subtle styling. Photo by Evan Perrone. With your properly equipped bike taken care of, make sure you also equip yourself with proper winter attire. This is the area where a rider must really assess their riding commitment and invest accordingly. A rider who is going out for a twenty to thirty minute spin or commute is not going to require the same level of gear that a rider going for a three-plus hour ride will need. Here are some of the basics. Winter riding gloves are specifically designed to ride in and the way that wind and water resistance is layered into the glove will provide superior comfort in bad conditions. Winter tights are also a critical piece of gear. Buy some without a chamois pad in them, so you can rotate your summer shorts underneath instead of having to buy a lot of pairs. It is a good way to save some coin. Consider tights that have wind-blocking features. They have a wider temperature range than a cheaper non-wind-blocking tight. A trusty jacket is another item of clothing that no cyclist should be without. Valuable features include wind and water protection, venting, and modest insulation. One of the best values out there are jackets that convert to a vest. This one piece of clothing can give a rider three season versatility. Lastly, winter riders should also invest in some overshoes or winter boots. Overshoes are a neoprene sheath that covers the entire shoe, making it wind and water resistant. Overshoes provide an economical way to convert your summer shoes into winter ones, providing that necessary warmth. If you plan on riding in the coldest, nastiest weather Mother Nature serves up, winter boots make a big difference. Nothing keeps your feet warmer or dryer. Period. Build your winter wardrobe little by little every year, and before you know it, you will have a piece of clothing for any circumstance. Get ready to spend. Many riders get sticker shock when they see the prices of many pieces of winter apparel. Yes, it does cost a lot, but it is also an investment that makes sense. You really only need your winter gear a quarter of the year-which means that you will get years of reliable service from them. Build your winter wardrobe little by little every year, and before you know it, you will have a piece of clothing for any circumstance. Preparing for winter riding may seem daunting at first, but after that brief period of adjustment, a lot of fun and excitement is in store for the winter cyclist. Preparing you and your bike for the cold months will help you channel your inner Ernest Shackleton, and instill within a desire to pedal through the coldest days. Remember, there is no such thing as bad weather, just the wrong choice in equipment.